Thanks so much Guy! The refund appeared in my account today. Thanks! 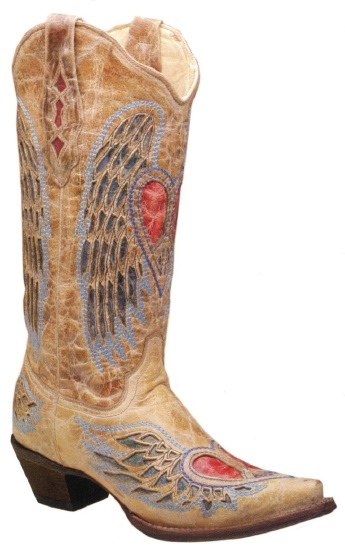 Corral Ladies Fancy Inlay Collection Western boot with Antique Saddle Foot with Fancy Inlayed Wing and Heart and 13 Inch Antique Saddle Top with Fancy Inlayed Wing and Heart featuring a Cushion Insole for all day comfort. This boot also features a Narrow Square Snip Toe with 1 3/4 Inch Short Base Cowboy Heel and Leather Outsole with Rubber Plug for long wear. Corral Boots are made by the finest leather craftsmen in the world. Throughout the last century, expert boot makers have journeyed to Leon Mexico, the heart of boot making in North America. Only the most experienced boot makers in Leon create Corral Boots. We use the finest exotic material in the hand crafted manufacture of our boots and shoes. Corral Boots, some of the hottest styles going in todays boots, so popular consider self fortunate if you don't have to wait too long to get them! Get your boots from Lonestar boots where the owner has over 25 years of boot experience and is willing to get you the best price possible. Please be aware, I carry most sizes in my store but if I am missing a size delivery is approximatley 90 days. Take avantage to the new lower prices! Corral Ladies Fancy Inlay Western Boot with Antique Saddle Foot with Fancy Inlayed Wing and Heart and 13 Inch Antique Saddle Top with Fancy Inlayed Wing and Heart featuring a Cushion Insole for all day comfort. Corral Boots are made by the finest leather craftsmen in the world. Throughout the last century, expert boot makers have journeyed to Leon Mexico, the heart of boot making in North America. Only the most experienced boot makers in Leon create Corral Boots. We use the finest exotic material in the hand crafted manufacture of our boots and shoes.